The six weeks following surgery when you are prohibited from putting basically any weight on your operated leg presents a special set of circumstances. On the one hand, you are tired and recovering and need a lot of sleep and are happy to hang out at home. On the other hand, you have basically been in the house for six weeks straight (in my case, almost four weeks to date) and you are starting to go stir crazy. As a result, I decided to venture beyond my apartment door a few times in the last couple of days to see, what the kids these days call, the outside. Yesterday I went for my disability evaluation with the MTA Access-a-Ride paratransit program (http://www.mta.info/nyct/paratran/guide.htm). Basically, its an on-demand alternative to standard public transportation which, if I am deemed eligible, I could use to get to my appointments and even to work since wheelchair accessible public transit is not really an option where I live. 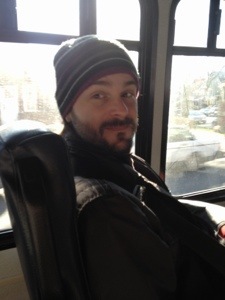 The evaluation required that I use an Access-a-Ride bus to visit the evaluation center. 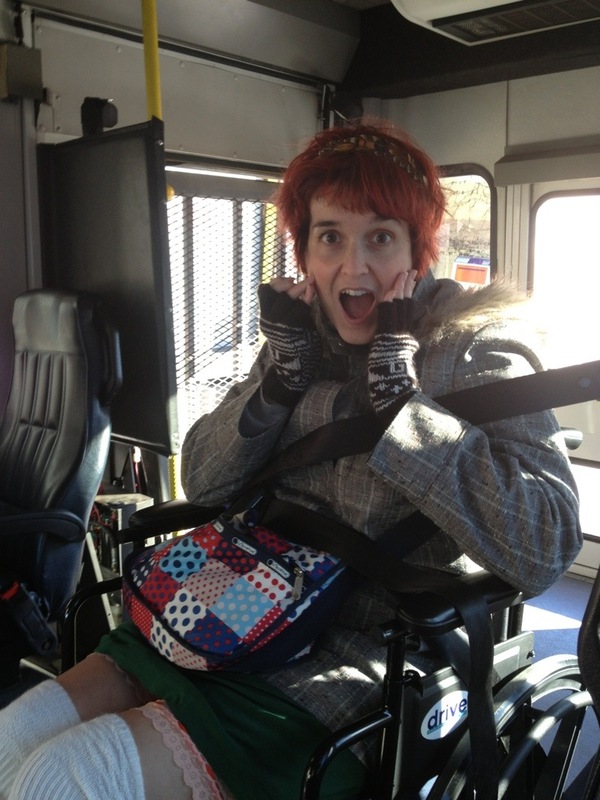 In the wheelchair and used the lift to get into the bus. Once onboard, I was SHOCKED (see shocked face) by how many cables and belts they used to make sure I did not roll around. My friend Dave helped push me around in the wheelchair. I am really bad with the wheelchair, like bad enough that the nice lady at the evaluation center suggested I take lessons. I get stuck in corners, a lot. I always think of that scene in Austin Powers where he tries to do a three point turn and gets stuck in the hallway. At least I can laugh — otherwise it would be tragic. I’ll hear within 21 days whether I’m eligible for service. Fingers crossed! My husband and I realized that it had been a long time since we’d taken our dog to the park to run around so on Saturday we bundled up like crazy and Guy wheeled all the way to Fort Greene Park so that Boris could play with his buddies. 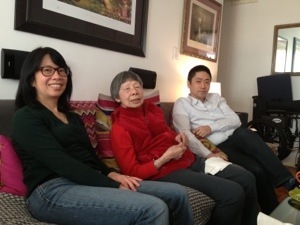 After all of that activity, it was nice to have a visit from my husband’s Aunt Margaret and cousin Elaine. They were so kind and brought pastries, bagels and a cake. We relaxed for a while — it has been so nice to have visitors. Since my energy is still FAR lower than it used to be and since my mobility is basically non-existent, I have appreciated that people have been willing to stop by. 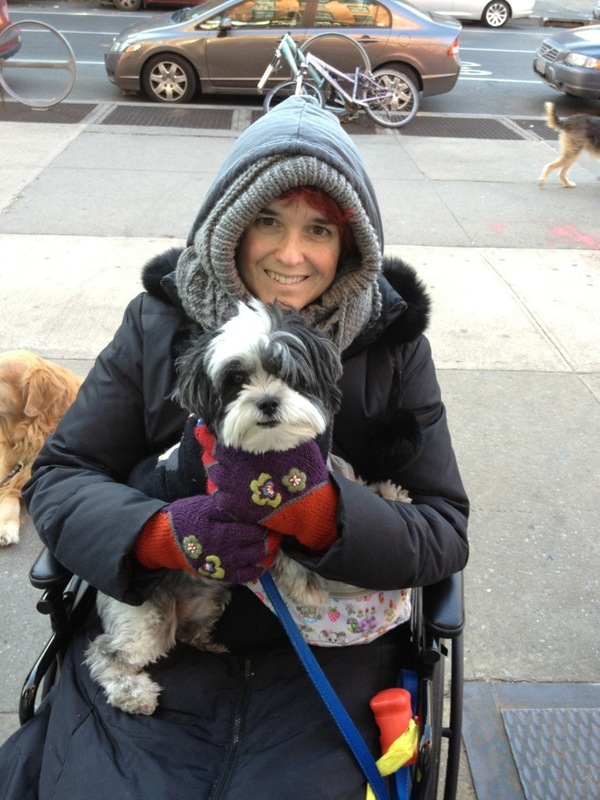 This entry was posted in Exercise, Hip Dysplasia, PAO, Recovery, Uncategorized and tagged Access-a-Ride, accessibility, ADA, Brooklyn, dog park, Fort Greene, MTA, paratransit, Wheelchair on January 8, 2013 by dramaticallyhip. I’m three weeks post op and I wonder why you have to use a wheelchair. I use a walker. I walk around campus with it. Hopefully I have not hurt something. I imagine a wheelchair would be too difficult to handle. My doctor wouldn’t even give me one. Do you guys not have a car? Is that why you need the transportation. My mom takes me to school or wherever. Your looking good. Great questions. 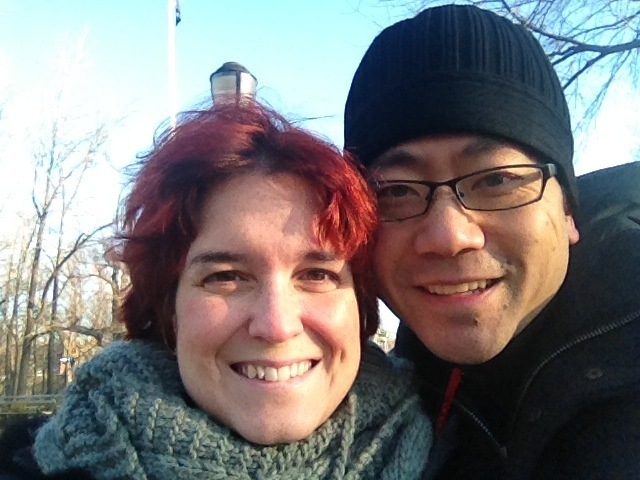 We live in NYC and don’t have a car so getting around anywhere requires I walk, often long distances. I’m still toe touch weight bearing. I can crutch a block or two but get tired easily and the worst us being out somewhere and getting stuck because you wear out. I only use my walker at my house. The wheelchair made it possible for me to go longer distances. I will stop using the wheelchair at all once I am flat foot weight bearing and can actually get around.